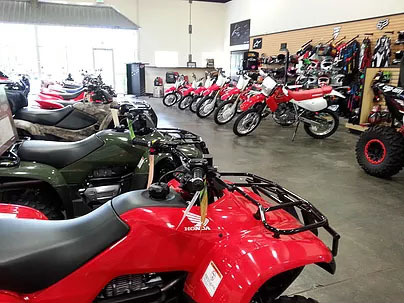 Lifestyles Honda is a Honda, Can-Am, Ski-Doo, Sea-Doo, Triumph and Honda Power Equipment dealership in Mount Vernon, Washington. If you asked them how they managed to stay small and sell big, they’d give you a simple answer: years of experience. Their mission is to offer their customers the latest in parts and products at the best prices, and with unparalleled service. They pledge to use their best efforts to make the customer experience both beneficial and enjoyable. Once customers give them a try, they’re sure they’ll be back for more! Ron VanWaveren, owner of Lifestyles Honda, knew the Sharp Shooter Program would deliver a great turnout for his annual Spring Open House. 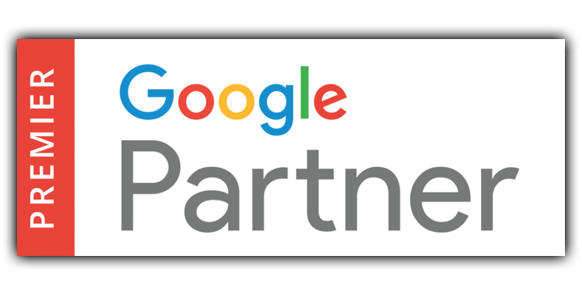 The short term goal of the program is to drive a lot of traffic to an event at the dealership and deliver a pipeline of leads that turns that weekend event into a month-long sales process. Long-term with consistency, we can create a SYSTEM for Predictable Growth by increasing the number of customers spending money with the dealership annually and the average amount of money they spend. Ron wanted to target a mix of both past customers and conquest prospects (people who ride what he sells, lives in his immediate backyard, but haven’t bought from him). 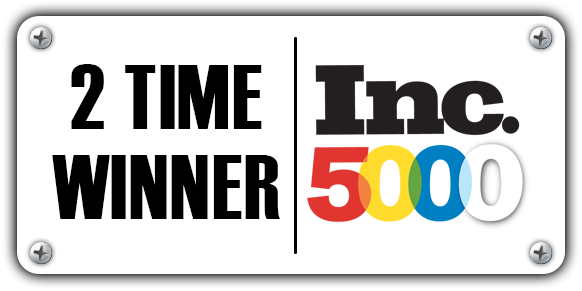 We selected 1,300 past customers and 1,300 conquest customers for this event. Once we identified the target audience, we went after them with up to 12 direct marketing strategies. By giving customers and prospects more opportunities to respond to the marketing, we increase the number of leads being generated (customers who tell us who they are and what they want to buy from the dealership), and the number of customers who walk through the door on event day. Ron wanted to put a spin on his Spring Open House this year by advertising the chance to win a 2014 Honda Motorcycle. Here’s how it works: The dealership purchases an insurance agreement covering the cost of the unit, giving customers the chance to win a bike for free. We then either print a number on the postcard or have customers come in and guess a random 6-digit number. The insurance company plays the odds that the customer with the winning number won’t show up or that no one will guess the correct number. This is an excellent way to add some traffic to your next event! Other than the bike giveaway, the message focused on the party he was throwing at his dealership including food, drinks, door prizes and more! Focusing on what the customer wants (the party) and not the sale, ultimately leads to more leads, traffic and sales in each department. The specific timing sequence of when all the marketing hit homes, went off without a hitch. Executing on all four pillars of the Sharp Shooter Program - Right Audience, Right Media, Right Message & Right Timing, really paid off. 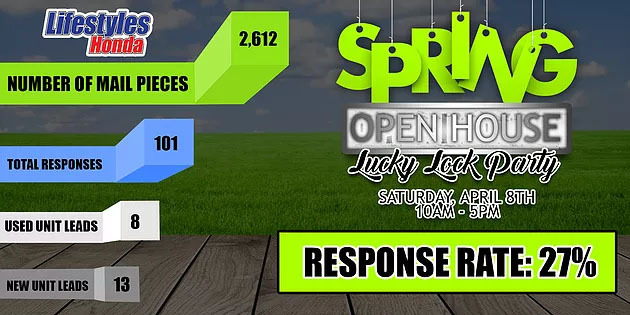 For their Spring Open House & Lucky Lock Party, the program generated 101 completed surveys including 68 sales opportunities in Clothing, P&A and Service, PLUS 21 responses for a new or used unit! May means the perfect time to ride and the perfect time to do an event. Between Cinco de Mayo, Armed Forces Day and Memorial Day, your biggest question won’t be should I do an event, but what event should I go big for! Check out the sample campaign postcard for a killer campaign option for May and for more information on how the Sharp Shooter Program can help you achieve your marketing goals in 2017, call me on my direct line 877-242-4472 ext: 112. Happy selling.